Back in Pieces, or What kinda fool secondguesses EZ? I should have learned the first time. I thought I HAD learned the first time. And then at some point last week I stopped and picked up the book again. The percentages. I’d forgotten all about the dag-gone percentages. And as it turns out, my “eyeballing it” method for the underarm join just didn’t cut it. So I’ve ripped back, and am going for a do-ever. Thankfully I was only about 4 rows into the shoulders when I made the decision. So it doesn’t hurt too bad. Last time I didn’t realize my mistake until it was too late to rip back- and I had to improvise. Now, I’m a fairly creative improviser, but I had to undertake extraordinary measures to fix the last EZ seamless saddle shoulder project I attempted. In that case, I had “fudged” the shoulder width a bit. That resulted in the sleeves sitting out too far, and being impossibly wide because they were not properly inset. 2. figure out a way to make a dart in the arm after I’d already gotten to the saddles for the shoulders. Then I gathered up the extra yarn from each row that was no longer taken up with stitches and collected it along the inside centerline of the sleeve, making sure the recreated stitches were all even in tension and such. 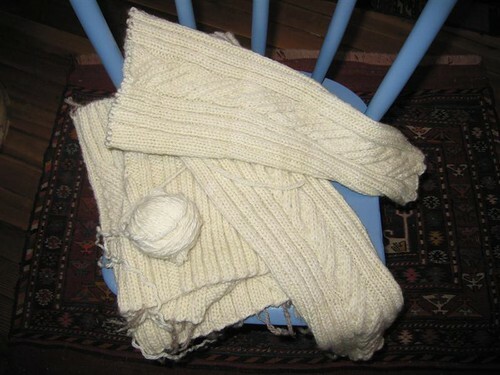 Then, I cut each yarn in the center (except maybe the first one or two, which were really quite short) and wove the ends into the neighboring stitches. I don’t even remember how many ends. Too many to count. Both directions. Each row. So, now the upper sleeves on this sweater are Seriously Reinforced. And the sweater is wearable. Not perfect, but wearable. Which is good, because I spun a whole little border leicester fleece to make it. It was a painful victory. And I think I learned my lesson. I ripped back, didn’t I?